Adorable! It's a mash-up of two of my favorite things: Star Wars and Winnie the Pooh. 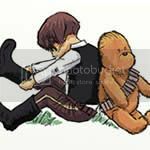 Check out James Hance's website, where he's selling poster prints of his reimagined Star Wars universe.